These are 18/0 stainless steel flatware sets, not the better quality 18/10 stainless steel sets. 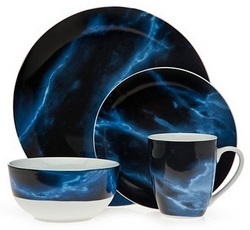 Godinger Carerra Blue 16-PC Dinnerware Set Only $39.99 From Macy’s! Macy’s has the Godinger Carerra Blue 16-PC Dinnerware Set marked down to only $59.99, plus add coupon code: HOUR48 to your cart to bring the price down to only $39.99! Macy’s has the The Cellar 12-Piece Square Set on sale for only $45.99! Macy’s offers free -in-store pickup, or free shipping on orders of $75 or more. Walmart has the Gibson Home Scarlet Leaves 12 Pc. Dinnerware Set or the Gibson Home Scarlet Leaves 12 Pc. Dinnerware Set marked down to only $17.17. Get free shipping with a $35 purchase, or choose free pickup from a Walmart store, otherwise its $5.97. 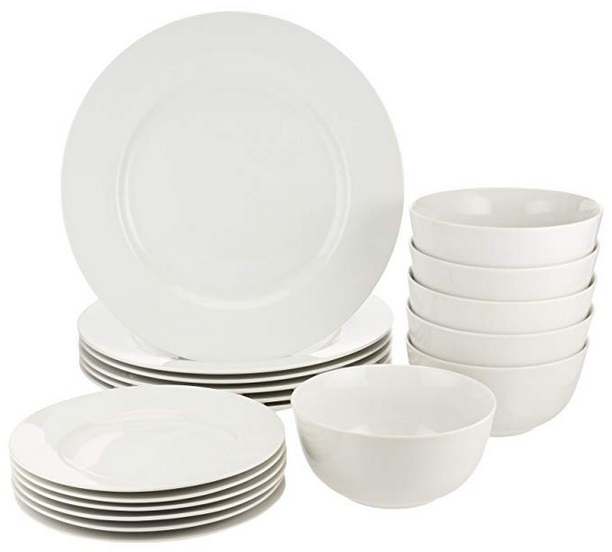 Century 21 has the Godinger 16-Piece White Encarta Dinnerware Set marked down to only $29.99. Get Free shipping on orders of $10 or more, with coupon code: C21SHIP11 added to your cart. TJ Maxx has the 20pc Cecelia Flatware Set marked down to only $29, plus get free shipping through today! 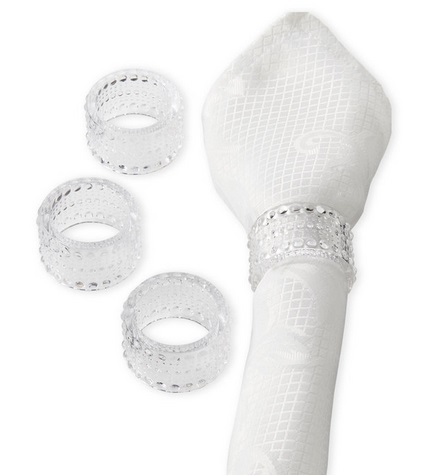 Godinger Set of 4 Crystal Lumina Napkin Rings Only $8.40 + Free Shipping! UPDATE: You can get these Lumina Napkin Rings from OneKingsLane for only $8.40 + Free shipping! Century 21 has the Godinger Set of 4 Crystal Lumina Napkin Rings marked down to only $12.99. Get Free shipping on orders of $10 or more, with coupon code: FREESHIP27 added to your cart, so if you purchase 6 or more you will get free shipping. 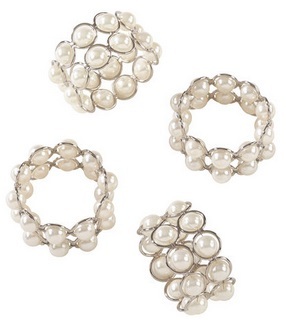 Century 21 has the Saro Set of 4 Faux Pearl Beaded Napkin Rings for only $12.99. Lenox Butterfly Meadow Party Plates, Set of 6 Only $13.99 + Free Shipping From Amazon!! Amazon has the Lenox Butterfly Meadow Party Plates, Set of 6 marked down to only $13.99 + Free shipping!! Mikasa Platinum Crown 40-Pc. 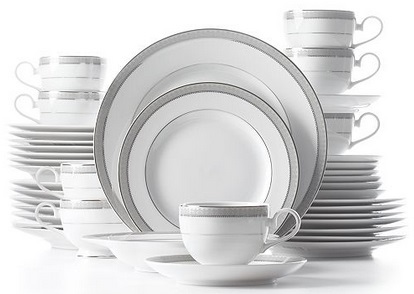 Service for 8 Only $149.99 + Free Shipping From Macy’s! Macy’s has the Mikasa Platinum Crown 40-Pc. Service for 8 marked down to only $149.99 + Free shipping! Godinger Salem 20-Pc. 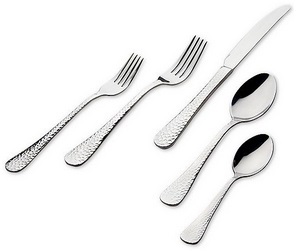 Flatware Set, Service for 4 Only $15.99 From Macy’s! Macy’s has the Godinger Salem 20-Pc. 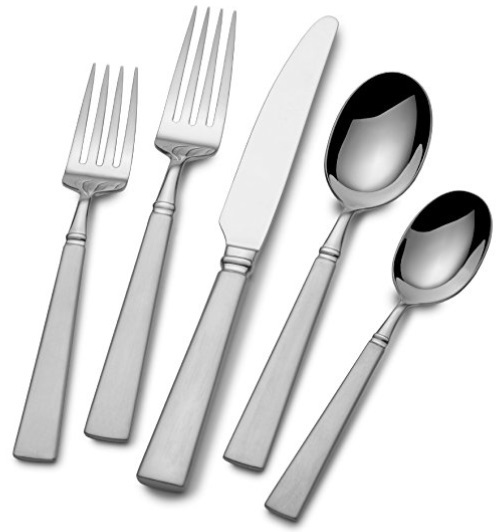 Flatware Set, Service for 4 on sale for $19.99, add coupon code: BIG to bring the price down to only $15.99! Macy’s offers free shipping on orders of $99 or more, or you can click here to get beauty items from just $3 to get free shipping on your order! 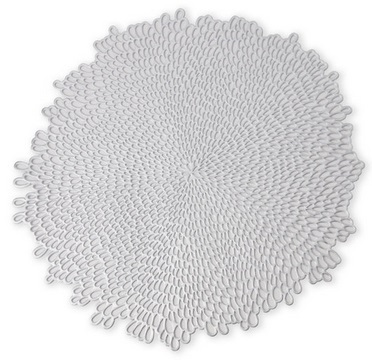 Century 21 has the Benson Mills Bloom Pressed Vinyl Placemat marked down to only $1.99. 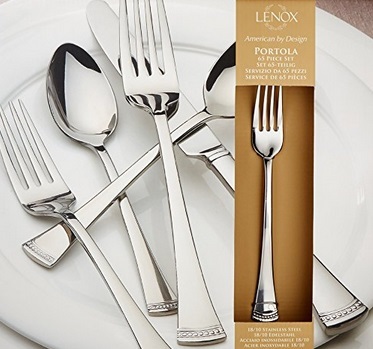 Amazon has the Lenox Portola Stainless Steel 65-piece Flatware Set marked down to only $89.90 + free shipping. Amazon has the Mikasa Cheers Stemless Wine Glass, 17-Ounce, Set of 8 marked down to only $30.60 + Free shipping (dropped from $49.99)! 50% Off All Dinerware and Drinkware From Pier1!! Pier1 is offering 50% off all Dinerware and Drinkware with coupon code: PARTY added to your cart! Get free shipping on orders over $49, with coupon code: FREESHIP49 added to your cart. • Golden Dipped Stemless Wine Glass – On sale for $6.68, and only $3.34! • Crackle Mist Blue White Wine Glass – On sale for $5.18, and only $2.59!! • Golden Luster Red Wine Glass – On sale for $5.18, and only $2.59!! • Crackle Clear Tall Tumbler – On sale for $4.78, and only $2.39! • Iris Clear Stemless Wine Glasses, Set of 4 – Priced at $34.95, and only $17.47! • Golden Decal Wine Glass Set – On sale for $26.18, and only $13.09! 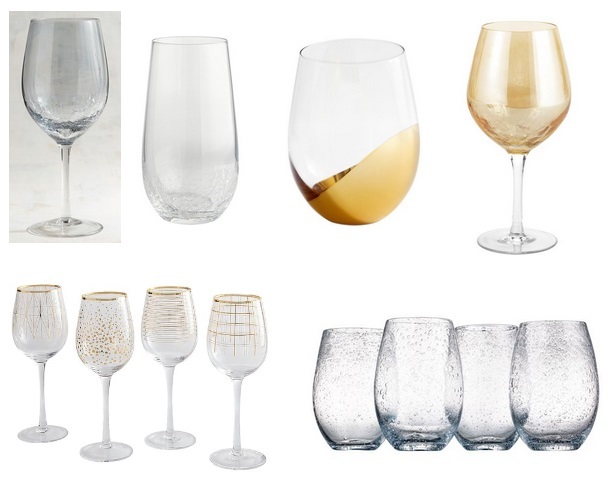 • Stemless 12-Piece Champagne Flute Glass Set – Priced at $29.99, and only $14.99! Amazon has the AmazonBasics 18-Piece Dinnerware Set, Service for 6 marked down to only $22.63 + Free shipping! Lenox Butterfly Meadow Hydrangea Collection 12-Pc. 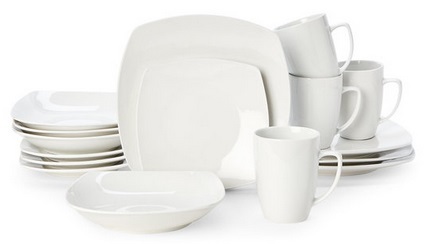 Dinnerware Set Only $69.99 From Macy’s! Macy’s has the Lenox Butterfly Meadow Hydrangea Collection 12-Pc. Dinnerware Set marked down to only $99.99, plus add coupon code: FRIEND to bring the price down to only $69.99! Macy’s: Lenox Butterfly Meadow 18-Piece Dinnerware Set + 2 Bonus Mugs Only $89.99 + Free Shipping! 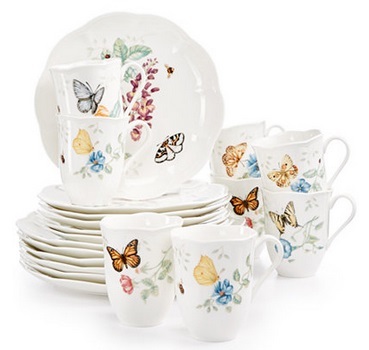 Macy’s has the Lenox Butterfly Meadow 18-Piece Dinnerware Set + 2 Bonus Mugs marked down to only $89.99 + Free shipping! 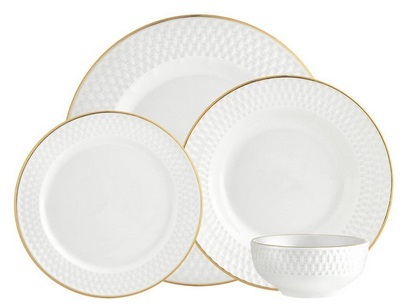 Amazon has the Vera Wang Wedgwood Vera Lace 5-Piece Dinnerware Place Setting Only $58.99 + Free Shipping (dropped from $94.99 – $112.10)! 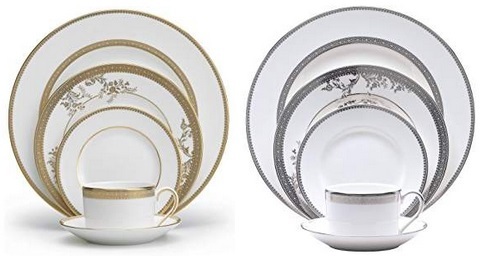 Amazon has the Vera Wang Wedgwood Vera Lace 5-Piece Dinnerware Place Setting (available in 2 colors) marked down to only $58.99 + free shipping. 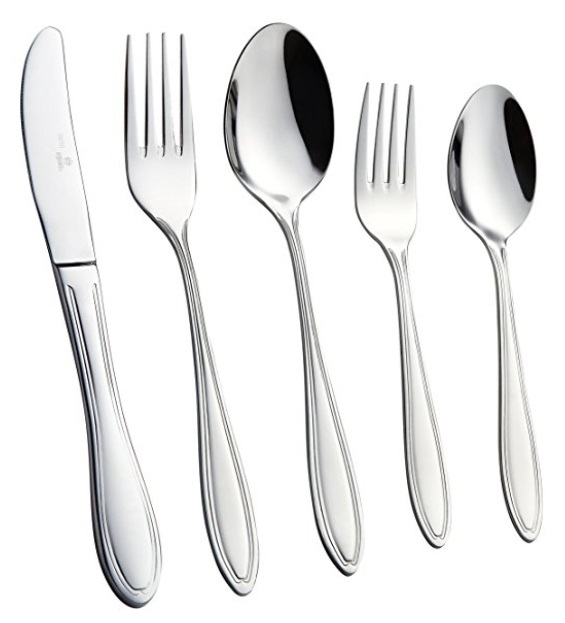 Amazon: Mikasa 5132405 Sympatico 65-Piece 18/10 Stainless Steel Flatware Set with Serving Utensil Set, Service for 12 Only $85.13 + Free Shipping (dropped from $129.64)! Amazon has the Mikasa 5132405 Sympatico 65-Piece 18/10 Stainless Steel Flatware Set with Serving Utensil Set, Service for 12 for only $85.13 + Free shipping (dropped from $129.64)! 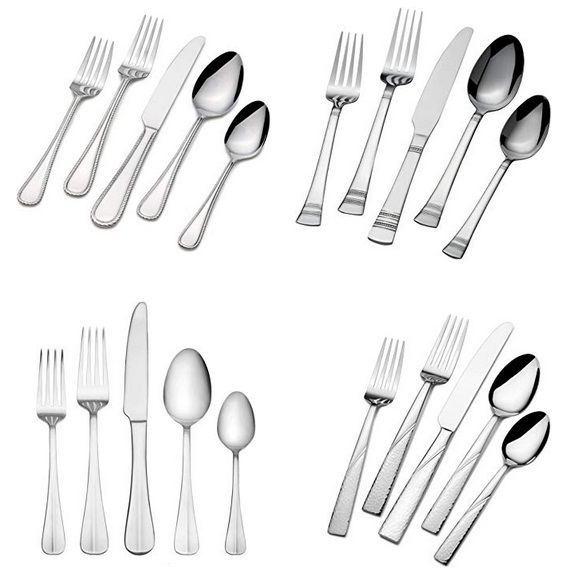 65-PIECE FLATWARE SET: This 65-Piece set includes (12) of each: teaspoon, soup spoon, salad forks, dinner forks, dinner knives. 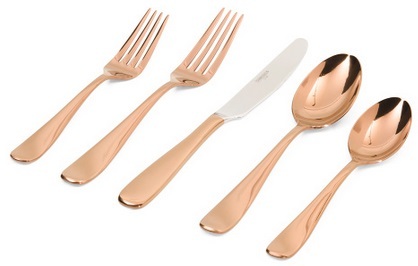 This set also includes (1) of each: teaspoon, cold meat fork, pierced tablespoon, and butter knife. Century 21 has the Godinger 16-Piece Avea Gold Dinnerware Set marked down to only $29.99. Get Free shipping on orders of $10 or more, with coupon code: FREESHIP23 added to your cart. 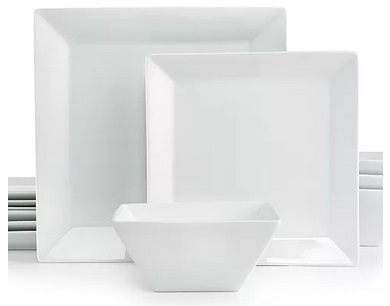 Amazon: Gibson Home 16 Piece Zen Buffetware Dinnerware Set, White Only $16.63! 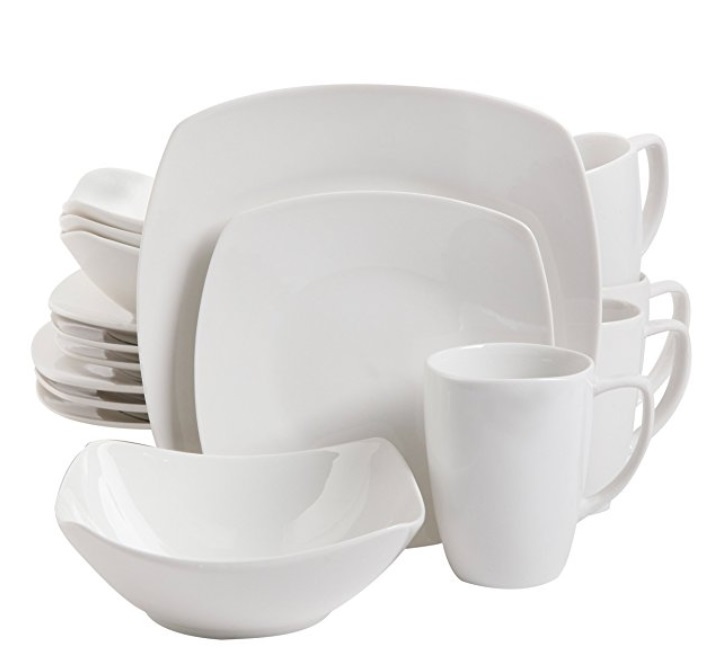 Amazon has the Gibson Home 16 Piece Zen Buffetware Dinnerware Set, White marked down to only $16.63! 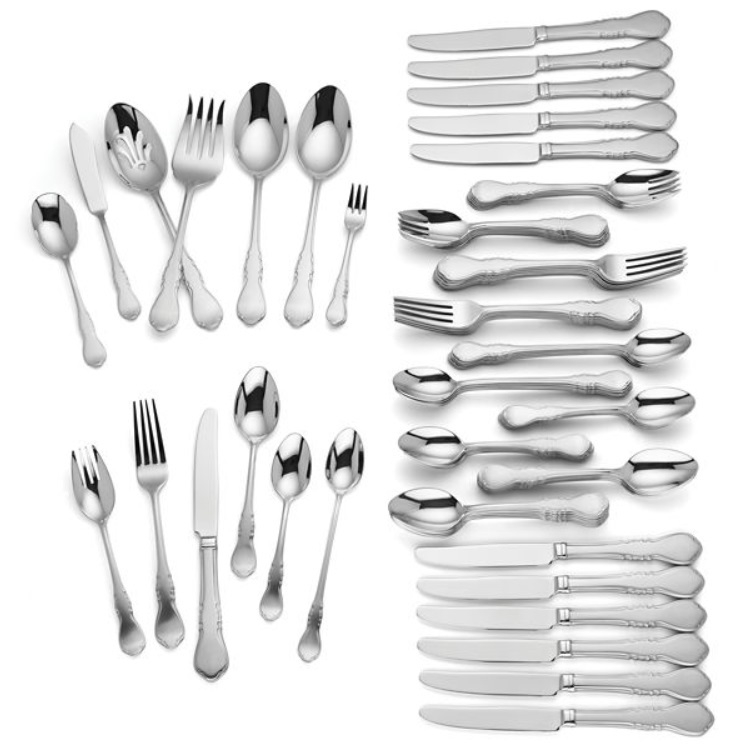 Wescott 82-Piece Flatware Set by Lenox Only $69.99 + Free Shipping! 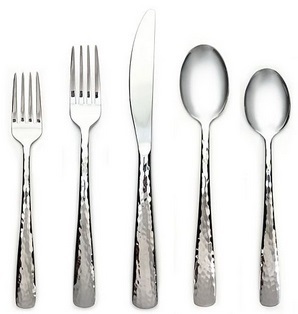 Lenox has the Wescott 82-piece Flatware Set by Lenox marked down to only $99.99, plus add coupon code: CLEARANCE to your cart to save an additional 30% off, and bring the price down to only $69.99 + free shipping! Macy’s has the Godinger Gustave 16-Pc. 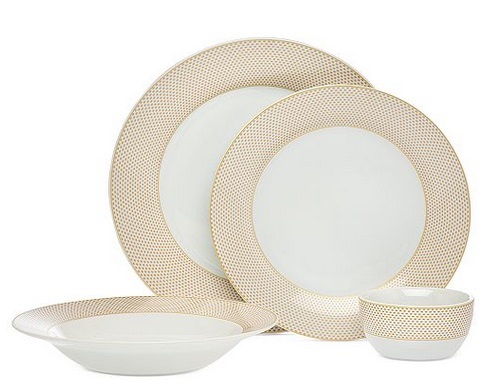 White Gold Banded Dinnerware Set, Service for 4 on sale for $79.99, plus add coupon code: FRIEND to bring the price down to only $55.99. Amazon has the Lenox 12 Piece Butterfly Meadow Hydrangea Set, White marked down to only $69.99 + Free shipping. UPDATE: The price started going up! Amazon has the AmazonBasics 2353-65 65-Piece Stainless Steel Flatware Set with Scalloped Edge, Silver, Service for 12 marked down to only $28.66 + Free shipping (dropped from $69.99, and now the lowest ever from Amazon)! Macy’s has these 12 Glass Sets marked down to only $9.99.